Ticket Refunds: There are no refunds. The festival will be held in all weather conditions. Some exceptional circumstances may be considered by the Yuin Folk Club Committee if application is received in writing. Treat your ticket as carefully as cash. This is your proof of purchase. By purchasing a ticket, or receiving a ticket as a performer, or as our guest, you acknowledge and accept the full terms and conditions set out on the Festival website http://www.cobargofolkfestival.com in your personal capacity and on behalf of any other member of a band or group you are applying for, and for any accompanying minor. In addition to any terms and conditions applicable to ticket buyers, any person entering the Cobargo Folk Festival site and camping areas as a Volunteer, Performer, Stallholder, Contractor or in any other capacity, agrees to abide by any other terms and conditions that form part of an agreement between that person and the Organisation. The Youth Policy sets out terms and conditions applicable to Youth at the Festival and the Festival Etiquette section outlines the Organisations expectations on behaviours in general. To the extent permitted by law, the Yuin Folk Club inc. (YFC) shall not be liable for any loss of enjoyment or wasted expenditure. YFC accepts no responsibility for any personal property loss, damage or breakage howsoever occasioned. The YFC Inc is the promoter of the Cobargo Folk Festival (CFF). It utilises existing grounds, buildings, roadways and pathways, of the Cobargo Showground Trust on an “as is basis” and subject to existing faults (if any), the current condition and state of repair, of those facilities. To the extent permitted by law, YFC disclaims all liability for any injuries or death sustained, however caused, during the running of the CFF. If you or a child under your supervision are injured, immediately ask a volunteer for assistance, go to the first aid tent or contact an emergency service. The Festival reserves the right to refuse entry or evict a person, without prior warning, who behaves in a manner inappropriate, offensive, dangerous or illegal. Proof of age ID will be requested when collecting a youth wristband. The youth must be under 18 on last day of Festival and must be accompanied by a Guardian. Provide their name and contact details and the name/s of youth in their care, which is to be recorded at the Ticket Office prior to entry to the Festival site. There is NO PUBLIC ACCESS to the Festival site (including camping areas), except for authorised personnel, volunteers and performers, prior to 8.30 am Thursday 28 February 2019. There are no refunds. The Festival will be held in all weather conditions. However, some exceptional circumstances may be considered by the Yuin Folk Club Committee if an application is received in writing before 1 March 2019. You must present your ticket voucher in exchange for a coloured wristband at the Festival Ticket Office, located at the entrance to the Cobargo Showground on the Bermagui-Cobargo Road. The wristband must be worn at all times. People without 2019 wristbands will be asked to leave the site. Children must also wear a wristband and be supervised by their parents / guardians at all times. Cobargo Folk Festival accepts Companion Card. Fare-paying cardholders will be issued a second ticket at no extra cost for their carer’s entry. Your ticket must be exchanged for a wristband before entering the Festival site and must be worn at all times. People with a government issued disability parking permit (disability parking is located within the site). Please see staff in the Ticket Office if you require assistance. You may also ring the Festival Site Office 6493 6666 before arrival so we can alert the gate people. PLEASE NOTE THAT NO HEAVY VEHICLE CAMPING WILL BE ALLOWED ON THE ARENA IN 2019. Camping fees must be paid before you can enter the Showground. Camping is for weekend ticket holders only. A free day car parking area is available for non-campers. Campers’ vehicles must have a Vehicle Pass displayed at all times. All campers must be respectful and considerate of their neighbours and the environment. Campers under 18 must be accompanied and supervised by a responsible adult camper (Guardian) over the age of 25. Caravans and RVs are welcome and must be positioned in designated areas at the Boronia or Banksia camping areas. Large Motorhomes, RVs and large Caravans are not permitted on the Arena. From 2019, the Acacia camping area on the Arena is reserved for tents, small campervans and camper trailers. Please be aware that camping spaces are limited and once they are sold out, no more camping tickets can be made available for sale. Powered sites are limited and must be pre-purchased (an extra fee $45 applies) and strict conditions apply to their use. 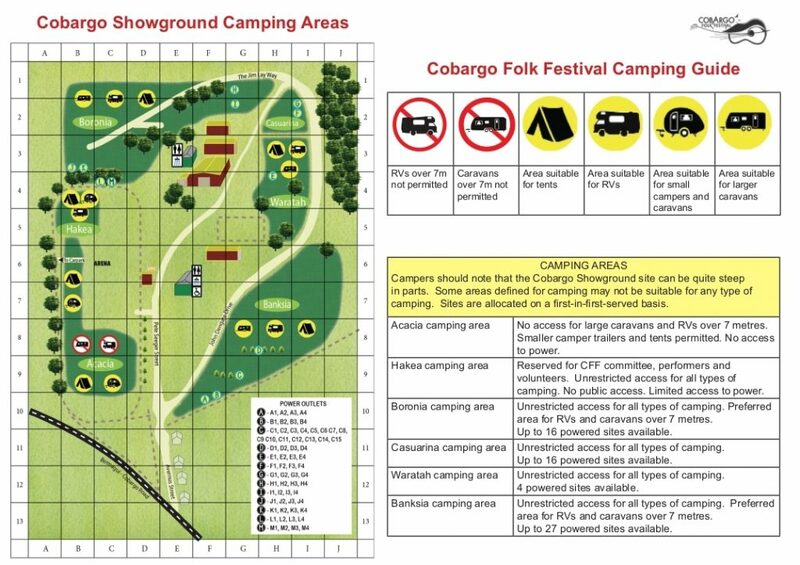 People who wish to pre-purchase a powered site should first buy a weekend ticket with camping then contact the festival organisers by sending an email to tickets@cobargofolkfestival.com to request a powered site and providing evidence of your ticket purchase. Priority will be given to people requiring power in association with a medical condition, by prior arrangement with the Yuin Folk Club. These arrangements also apply to Volunteers and Performers. One powered site, one user. It is the responsibility of the person who purchased the powered site to ensure no piggybacking of power leads. Sites will be inspected during the festival and piggybacked boards and leads will be removed. Offenders will be asked to move to non-powered sites. The Organisers do not accept responsibility for the consequences of any power failures or disconnection. Continuing misuse of powered sites may lead to the complete closure of all powered sites. NO ALCOHOL is to be brought into the Festival. The Festival site incorporates a Licensed Venue. Proof of age in licensed areas may be requested by staff. Our liquor licence terms and conditions require that all alcohol be consumed in the designated licensed area. Please don’t be that idiot who makes it harder for us to obtain a liquor licence. The Festival has a strict No Glass policy in the entertainment area. People with glass bottles will be told to bin them. 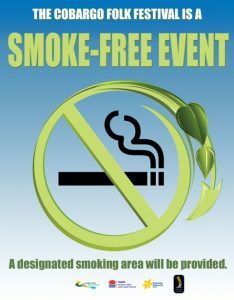 In accordance with NSW Government regulations the Festival is smoke-free. NO PETS are permitted in Camping or Festival grounds (Conditions of Insurers). Accredited assistance animals excepted . The Festival reserves the right to vary the advertised artists and/or program. The Festival is a WasteWise event. Please dispose of rubbish in the appropriate bin! All Festival participants must be mindful of their surroundings and respectful of the festival community. All Festival participants must be respectful of others and their property and must not interfere with, damage or cause harm to any others or their property. From 12pm onwards, noise in camping areas designated as quiet zones must cease. Loud, intoxicated, abusive or intimidating behaviour will not be tolerated anywhere on the Festival grounds. FESTIVAL ORGANISERS are all volunteers. Please treat them with respect to make this festival an enjoyable experience for all. We hope you will enjoy the 2019 Cobargo Folk Festival !